Learn how to increase club head speed and hit longer shots with this guide. If you keep up with the game of golf at all, chances are you have heard the phrase, “club head speed,” thrown around from time to time. Everybody wants more of it, but not everyone knows exactly how to get it. What’s more, a lot of people that don’t know, think that they do, and then wind up with a lot of problems. Fortunately, gaining club head speed doesn’t need to be difficult. It can be done following a few simple steps that we will illustrate in the coming paragraphs. 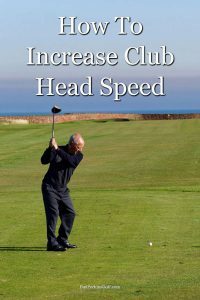 Read on for a comprehensive guide on how to increase your club head speed. What is club head speed? Club head speed is exactly what the name suggests it is: the speed your club reaches on its way to making impact with the ball. Why it is important is also fairly self-evident. The faster that your club head moves, the farther the ball will go when you finally make contact. The equation is simple, right? To gain more club head speed, one must simply swing harder. Not so. That’s the common misunderstanding that gets a lot of people into trouble. Swinging harder is a great way to hit a shot out of bounds, but that is about all it is good for. We will now look at a few of the ways you can gain club head speed without messing up your swing for longer shots, and a more enjoyable experience on the golf course. You don’t have to be covered in bulging muscles to drive the ball a long way. You just need to know how to swing the club the right way. Here are a few simple ways to add speed to your club head, and extra yards to every swing. Tempo is one of the most important aspects of any swing. It is valuable for a number of reasons actually, but in the case of the long ball, a good tempo is going to help make sure that your club head is reaching its maximum velocity right at the moment of impact. If you really want to hit the ball a long way, you need to make sure that your club head gradually builds speed on the way to the ball. All too often, players whip the club back quickly and waste too much energy on the backswing. Not only is that not helping you hit the ball farther but it will also most likely have a very negative impact on your accuracy as well. Instead, you want to take the club back smoothly, and then transition into a quicker downswing. Ideally, your backswing will take three times as long as your downswing. If you can achieve that tempo it will result in a much more efficient use of the strength and power that is already built into your swing. A good golf swing is going to utilize your entire body, and that means integrating a generous turn into your swing. Your backswing should begin with your shoulders turning away from the target, guiding your club back until it is parallel to the ground. This move is probably naturally already built into your swing and you won’t really have to think very much about it. As your shoulders begin their turn, your hips will follow ever so slightly as well until you are completely coiled at the top of your swing. To being your downswing, you will start with your hips, turning them back towards the target. Once your hips activate, you can proceed to uncoil the rest of your body. Note that these movements are happening almost simultaneously – there is virtually no lag from the time that you begin to uncoil your hips, to the point that you start turning your shoulders back towards the target. As your shoulders fire, your arms follow, and finally, the swing ends when your hands have released through the ball. An easy way to remember the order of operations is to keep in mind that it is the exact opposite of the backswing, which occurs mostly organically so you won’t need to memorize it. That’s not a bit of advice that you expected to get, is it? There is a common misconception that a shorter backswing is better. If a short backswing is natural to you for some reason that is fine – though it can be limiting in a lot of ways. However, many players are unfortunately under the impression that if they abbreviate their backswing it will lead to more accurate shots. This isn’t true. All shortening your backswing will do is get your tempo out of whack, which as we already know leads to inconsistent flight patterns and shorter shots. A longer swing is generally smoother and it also has more of an opportunity to gain club head speed on the downswing. Ideally, your backswing will end when the shaft of your club is parallel to the ground. If you take the club past parallel you are running the same risk that you take when you abbreviate your swing for no reason. A longer swing with a good tempo is a surefire way to gain distance without swinging harder, and, better yet, without making any trips to the gym. Mastering the long ball will undoubtedly help you save some strokes, and it also doesn’t hurt that cranking drives deep down the fairway happens to be an enjoyable way to play the game. As you have seen, these techniques aren’t really difficult. In fact, they are relatively basic components of a good swing. Naturally enough, swinging well relates pretty seamlessly to hitting the ball farther. Longer drives are a great way to reduce your score, impress your friends, and have a lot more fun as you play the game of golf, so start practicing those fundamentals. You will be glad you did when you can watch your buddies’ jaws drop when they see what you can do off the tee. Now you know how to increase club head speed, get practicing and see the difference it makes!